French President Francois Hollande, center, and Prime Minister Manuel Valls, right, walk through the lobby of the Elysee Palace after the weekly cabinet meeting, in Paris, Nov. 18, 2015. Following the Paris terror attacks, President Francois Hollande has pledged to pursue hard-line security measures that will require constitutional changes. Some critics worry civil liberties will be infringed unnecessarily by legislation giving the police and security services new powers. 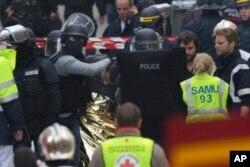 They also assert that while emotions are running high, the French government should not move too hastily. 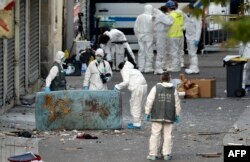 A stunned France is where the United States was 14 years ago after the terror attacks in New York and Washington, D.C., when American lawmakers quickly enacted a broad swathe of law-enforcement measures, prompting the ire of civil libertarians concerned about unintended consequences. So, too, in Paris, where rights groups are expressing alarm about an aggressive crackdown that would leave the police and security services less restrained. Hooded police officers detain a man in Saint-Denis, near Paris, after a raid on an apartment where the suspected mastermind of last week's terror attacks in the French capital was believed to have been holed up, Nov. 18, 2015. Civil libertarians are asking where the line between national security and civil liberties should be drawn in a liberal democracy. “In the face of such a tragedy, we must now take a hard look at reality and not be afraid of facing the complex causes that led to these events,” said the rights group La Quadrature du Net. “Unfortunately, given recent political statements, we fear the only response will lie in further bombings in the Middle East and the escalation of security measures evermore harmful to fundamental rights,” the group said. Speaking after a seven-hour police siege Wednesday linked to Friday’s attacks, Hollande emphasized again that France is "at war" with terrorists, but he also said it is important the country does not overreact. He acknowledged concerns about civil liberties and said temporary measures are needed to identify terrorists and dismantle terror networks. Debate about how far a liberal democracy can go in defending itself without changing its values predates the current jihadist terrorism challenge. Western European governments struggled with questions about national security and civil rights when they were faced with a wave of far-left and anarchist terrorism in the 1980s. So did British authorities during the troubles in Northern Ireland, where the right to jury trials and the right of a defendant to remain silent were suspended. 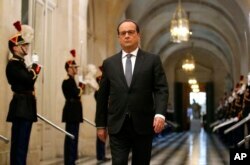 Some of what Hollande wants to enact remains unclear. He told lawmakers in a rare joint session of both houses of the country’s parliament Monday that authorities should have the right to revoke the citizenship of convicted terrorists who have dual citizenship. He has called on parliament to pass constitutional amendments to give the security state more power to go after suspected terrorists, allowing police to conduct raids without court warrants and giving the intelligence services greater data surveillance rights. He also wants measures that would allow the state to place people under house arrest. House arrests and warrantless raids are already taking place under a 1951 law the government is using to endorse a state of emergency that Hollande has extended for another three months. That law may well be unconstitutional, as it predates the 1958 constitution. None of what Hollande is proposing worries newspaper columnist Anne-Elisabeth Moutet, a commentator on France 24 television. Nor does she believe the French public is alarmed. French President Francois Hollande arrives to deliver a speech at the Versailles castle, west of Paris, Nov. 16, 2015. She said this attitude partly stems from a post-attack mood of national unity and partly from a respect of the behavior of security services in past national emergencies. Terrorism, she said, is not new to France. David Soldini, a public law professor at Paris’ Sorbonne University, sees dangers, though, in what Hollande wants to do, saying the impact on civil liberties could be serious and have long-term consequences. Soldini focuses on the warrantless raids and searches, arguing that taking away judicial supervision undermines a crucial civil liberty guarantee. 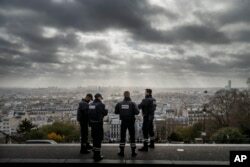 Paris is seen as French police officers stand on guard near the church of Sacre Coeur, on top of the Montmartre hill, in Paris, Nov. 18, 2015. France already was implementing strengthened security and surveillance measures enacted after the Charlie Hebdo attacks in January. Soldini points out nothing Hollande is proposing would have necessarily prevented last Friday’s Paris attacks. The problem may lie not with what laws are on the books, but with the resources French authorities have to combat the terrorists. In an interview Monday with the French magazine L’Obs, Marc Trévidic, an anti-terrorist judge who has been critical of the government, said the sheer scale of the terrorist threat is daunting. “The number of people under surveillance has become problematic. There are as many individuals as monitoring agents of the Directorate of Internal Security [SID], you must realize that!,” he said.